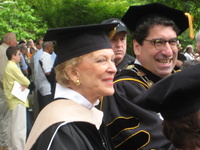 Martha Robinson Rivers Ingram (born 20 August 1935) is the chairman of Ingram Industries, former chairman of the Vanderbilt University Board of Trust, and a noted philanthropist and patron of the arts. She was married to the late E. Bronson Ingram, who inherited his father's petroleum and barge empire in 1963. In 1995, Martha Ingram succeeded her late husband as chairman and chief executive officer of Ingram Industries, one of America's largest privately held companies. At the time, she was better known for her commitment to the arts in Nashville, Tennessee, where she and Bronson made their home. She has since become a respected executive in her own right. This webpage uses material from the Wikipedia article "Martha_Rivers_Ingram" and is licensed under the GNU Free Documentation License. Reality TV World is not responsible for any errors or omissions the Wikipedia article may contain.